If you’re looking for a durable bathroom partition for your facility that’s also high-versatility and low-maintenance, take a look at our solid plastic bathroom partitions. Solid plastic partitions are suited to a vast array of applications. They are the perfect answer to high-traffic facilities, particularly those that are high-humidity and vandalism-prone, offering a lifespan of years with low initial cost and considerable savings from low ongoing costs. Our one-inch panels are created from an advanced formula of 30% pre-consumer recycled, high-density polyethylene (HDPE) and polymer resins that are combined under high pressure to form a single, rigid component. What you end up with is an extremely durable and non-absorbent product that’s impervious to moisture and therefore rust, corrosion, delamination, and mildew as well. A self-lubricating surface makes solid plastic bathroom partitions a winner in their ability to shed graffiti with easy cleaning. Even scrapes and scratches can be remedied by simply burnishing with a heat gun or a blow dryer. This leads to massive savings over the years of life this material endures. It’s clear that solid plastic bathroom partitions are a great choice for almost any building, but they tend to shine in high-traffic areas that can lob all sorts of wear and tear at them. Good candidates for solid plastic partitions include shopping malls, stadiums, and arenas. Large educational institutions, particularly in high-risk neighborhoods, usually require a focus on vandalism and graffiti. 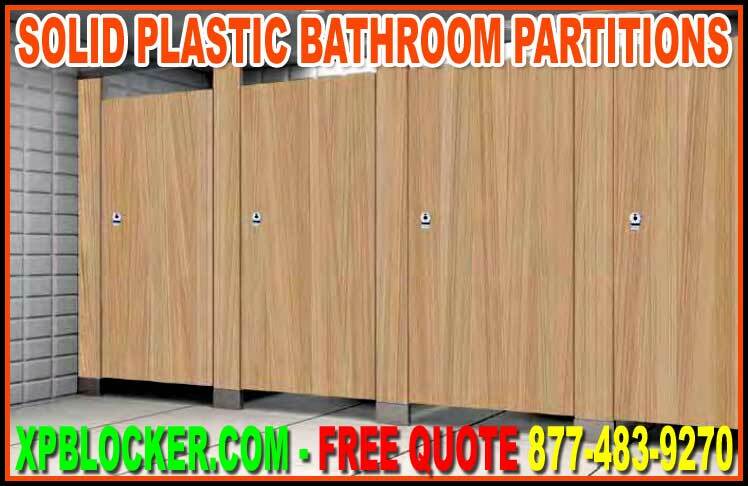 Solid plastic bathroom partitions offer excellent resistance to these types of damage. Small-town libraries and civic centers are two public facilities that would enjoy the return on investment through minimal ongoing costs, including those for repairs, over a long lifespan. By accommodating younger visitors, the vandal resistance of solid plastic bathroom partitions means easy repair as opposed to costly replacement. With their imperviousness to moisture and therefore high resistance to delamination, rust, mildew, or odor absorption, solid plastic bathroom partitions are excellent for facilities that experience high humidity. This includes community pools as well as water or theme parks. Small-town athletic centers see a lot of visitors throughout the day – and virtually no one leaves without taking a shower first. Since toilet and shower facilities often share the same space, the moisture resistance of solid plastic partitions keeps bathroom partitions in good shape despite the humidity from nearby shower stalls. Another benefit of these partitions is their aesthetic value. Our solid plastic bathroom partitions also come in 21 possible color choices that cover a wide range, from black to burgundy to deep blue. Among these and other colors and patterns, you’re guaranteed to find an option that will flow with the design sense of your facility. For a more natural look, some of our colors emulate a wood appearance—a welcome accent for a number of particularly small-town facilities that still want to evoke a rustic and intimate atmosphere despite heavy traffic. Restaurants are one type of business that comes to mind. Many opt for painted metal partitions, but solid plastic bathroom partitions in soft or natural wood tones would offer a more attractive look and low-maintenance costs through ease of repair. Other possibilities are spas and small health clinics that want to give a sense of warmth to their restroom facilities. Naturally with all that solid plastic bathroom partitions offer, there’s equal versatility in bathroom stall layouts and mounting configurations. All four common layout options are available: Between Wall, Open End, Free Standing, and Alcove. With respect to mounting options, we have Floor to Ceiling Mount, Ceiling Hung, and Floor Mounted Overhead Brace types. We know not all restroom facilities are constructed the same and vary greatly in spatial dimensions. That’s why we are happy to help you determine which types best fit your needs. In the high-traffic facilities where these solid plastic bathroom partitions work best, it’s imperative that you ensure their ease of use for all people, including those with disabilities. We can customize your bathroom partitions and any accompanying hardware for full accessibility compliant with ADA standards and other regulatory codes that may apply to your specific locality.